This holiday season, stuff your stockings with local products that support local farmers and artisans in Western Massachusetts! 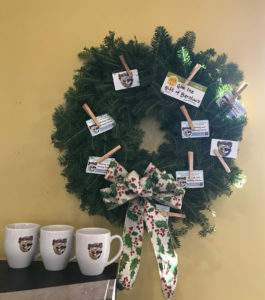 You can pick up all of these great stocking stuffers and more at your neighborhood dairy farm – yep you guessed it – Barstow’s Dairy Store and Bakery! A Barstow’s ceramic mug for the coffee or tea drinker. A pint of maple syrup from North Hadley Sugar Shack, Hadley, MA. A jar of honey made by local bees from Shelburne Honey Company, Shelburne, MA. A Barstow’s gift certificate for the Barstow’s Dairy Store and Bakery lover! A hand crafted coin bottle opener from Falls Custom Carpentry, South Hadley, MA. Natural flavored honey sticks from Shelburne Honey Company, Shleburne, MA. A pendant necklace from Figment Labs. A jar of local honey from Bear Meadow Farm, Colrain, MA. Locally roasted coffee from Pierce Brothers Coffee Roasters, Greenfield, MA or Rao’s Coffee Roaster, Hadley, MA. A Barstow’s tote bag to carry all your local merch! A bag of pancake mix to enjoy on Christmas morning from the North Hadley Sugar Shack, Hadley, MA. A jar of popcorn by Pioneer Valley Popcorn, Hadley, MA. A handmade pot holder from Sue’s Sewing Corner, South Hadley, MA. A six pack of cookies fresh from the bakery! Stop in to Barstow’s (and other local businesses!) to support local families in your community this holiday season! Gift local, support local!